Buses are faster and ridership is up — though pedestrian safety challenges persist. 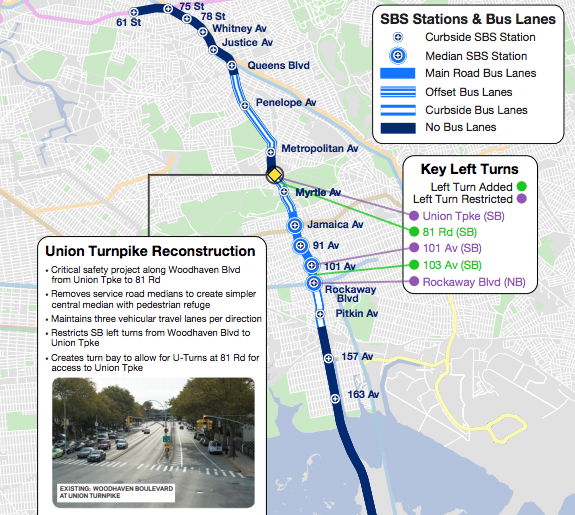 Bus trips are faster and ridership is up along the one-year-old Select Bus Service line on Woodhaven Boulevard, defying project opponents who spent years arguing that dedicated bus lanes would create traffic armageddon. Instead, the $200-million bus service upgrade on the Q52/53 is doing exactly what the Department of Transportation said it would: improve bus service and save lives, according to a just-released report detailing the city’s success speeding up transit and slowing down traffic on Woodhaven Boulevard [PDF]. The 30,000 or so bus riders who take the Q52/53 and other routes along corridor are moving 10 percent faster. Ridership is up between five and eight percent. And average car travel times — which opponents claimed for years would be severely hindered by the project’s bus lanes — are more or less flat, up an average of just 30 seconds where bus lanes were installed, according to the DOT. Between 2009 and 2013, 17 pedestrians were killed on Woodhaven and Cross Bay boulevards. And between 2012 and 2016, traffic crashes killed or severely injured 129 people. But since the SBS route went into effect, crashes with injuries are down six percent. The Q52/53-SBS takes riders from a northern terminus in Woodside down Woodhaven and Cross Bay boulevards all the way to Far Rockaway. 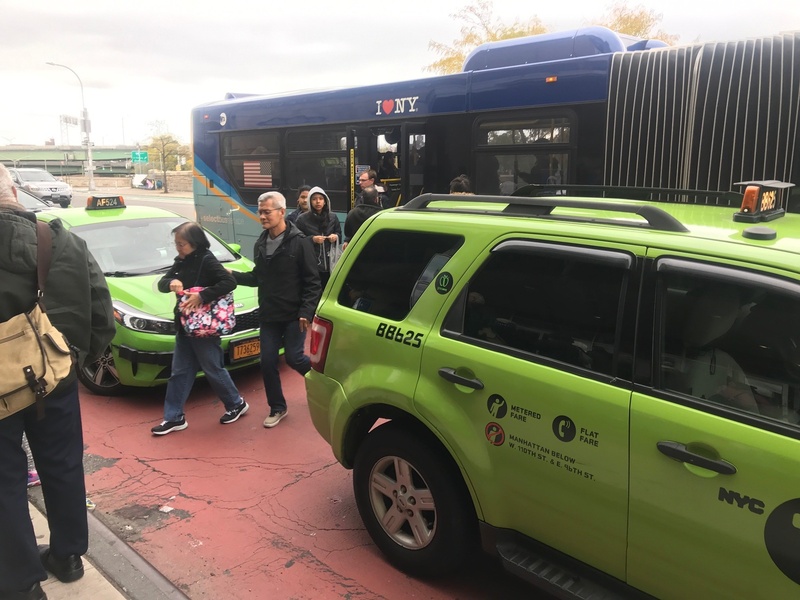 DOT’s most impactful and controversial changes were between Queens Boulevard and 156th Avenue, where the agency implemented bus lanes and left-turn restrictions. Between Park Lane South and Rockaway Boulevard, the city was even more ambitious, putting the bus lanes in the central roadway next to concrete medians, which it widened to create robust SBS stations. To improve conditions for pedestrians, DOT did more than just ban certain left turns, which are statistically more dangerous than any other driving maneuver. The project was peppered with widened medians, pedestrian islands, expanded sidewalks, and new crosswalks. DOT wasn’t able to put in those improvements without a fight — one carried out through nearly 40 meetings with community groups, elected officials, and others. In the three years leading to last November’s SBS launch, opponents such as State Senator Joe Addabbo, Jr. and Assembly Member Mike Miller tried their hardest to stop it from happening at all. With apparently little regard for their transit-dependent constituents, Addabbo and Miller argued that the bus lanes and turn restrictions would slow traffic. DOT, for its part, says it’s working on ways to further improve pedestrian safety at Jamaica and Woodhaven. But Addabbo and Miller have continued their war on transit riders and pedestrians. In September, after the most recent fatality at Jamaica Avenue, Miller claimed, without evidence, that the Select Bus Service project had “some bearing” to the continued carnage at that corner. Addabbo has taken a different line — albeit on familiar to Queens transit and biking advocates. He claims, also with little evidence, that the bus lanes have hurt small businesses along the corridor. Neither Addabbo nor Miller returned calls from Streetsblog on Tuesday. One can only assume they didn’t want to face the truth: Woodhaven SBS works. Richards’s Far Rockaway constituents have told him the new service has cut their commutes by as much as 15 minutes. The camera gaps for our bus lanes are a real problem. Is the state actually dictating the number of cameras per bus lane? Every inch of every lane needs camera enforcement. That’s why the didn’t want center running. So they would have a bus lane to abuse as a drop off lane. You win twice — show the customers that if they pay up not only are they better off, but the serfs on the bus are worse off. We need to establish the idea that instead of making left turns, motor vehicles should make three right turns and go around the block. I believe UPS requires its drivers to do this for safety reasons. Then you could have center-running bus lanes, and bike lanes. And trips for other motor vehicles might speed up too, especially in cases where there are two moving lanes in each direction — one blocked by double parkers, and the other by left turners. What would be nice is if 311 would advertise using their app at these bus stops, so more people know that they can report taxi complaints. From my experience, the taxi drivers will get fined, especially if you have a photo to prove it. The bus gains cited in linked DOT Report are not corroborated by the MTA’s GTFS schedule. I found the reverse to be true, when I compared the 10 Feb 2016 and 14 Feb 2018 GTFS schedules. The schedules for the entire day between the 157th Ave and Queens Blv stops (northbound) show the following. Average and median scheduled travel times in 2016 were 26:24 and 26:00 vs. 29:18 and 27:00 in 2018. DOT’s report showed the averages to be 30.9 and 27.8 minutes. The corresponding southbound figures show a similar story. The scheduled average/median Queens Blv to 157th Ave travel times are: 25:38/26:00 in 2016 vs. 28:59/27:00 in 2018. The rush hour schedules between the different segments show a similar discrepancy. UPS routes also include illegal right turns. Remember to memorize the refrain that “(whatever improvement) has hurt small business” and you have your opposition to whatever transportation/bike lane/livable street/pedestrian plaza is proposed anywhere. Perhaps if we lived in a suburb where 95% of people that drive that might be true. But most places in NYC except maybe the furthest outreaches of Queens, Brooklyn and Staten Island have most people not coming by car – surveys have shown that below Manhattan’s 59th street only 6% of customers come by private car. Of course that won’t be the same outside of Manhattan but certainly the majority of people are arriving not by car.